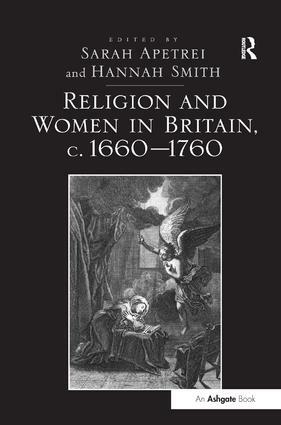 The essays contained in this volume examine the particular religious experiences of women within a remarkably vibrant and formative era in British religious history. Scholars from the disciplines of history, literary studies and theology assess women's contributions to renewal, change and reform; and consider the ways in which women negotiated institutional and intellectual boundaries. The focus on women's various religious roles and responses helps us to understand better a world of religious commitment which was not separate from, but also not exclusively shaped by, the political, intellectual and ecclesiastical disputes of a clerical elite. As well as deepening our understanding of both popular and elite religious cultures in this period, and the links between them, the volume re-focuses scholarly approaches to the history of gender and especially the history of feminism by setting the British writers often characterised as 'early feminists' firmly in their theological and spiritual traditions. Sarah Apetrei is Departmental Lecturer in Ecclesiastical History in the Faculty of Theology and Religion, University of Oxford, UK. Hannah Smith is Tutorial Fellow and University Lecturer in History at St. Hilda's College, University of Oxford, UK.